Idaho prisons, jails and courtrooms aren’t just parts of the criminal justice system. They also have been tasked with providing treatment to Idahoans with mental illness. Judge Michael Reardon started working at Ada County Mental Health Court seven years ago, in addition to his work as a family-law magistrate judge. Reardon says the people in his courtroom are “by and large a pretty vulnerable population.” One of his goals is to demonstrate that a person with great authority is invested in their futures and wants to see them succeed. He calls defendants by their first names. He knows their family tragedies and their pets’ quirks. During a recent hearing, he talked about guitar chords with one male participant, offered a second some pointers on fixing a bike flat, then gave a third eight hours of community service for misbehavior. Q: What made you want to do this job? A: I developed a sympathetic interest in it as a fairly young prosecutor in a robbery case I had. The defendant was a fellow in his late 50s. He’d been a high school principal and a teacher, then he lost those jobs and ended up as a security guard at a campus or something like that. And all of a sudden, he’s finding a toy gun and a rubber mask and sticking up a bank in Boise. He didn’t have anything to do with that chemical imbalance that went off in his brain. This is a guy who had a really successful life. And then he didn’t. From that point, I think I’ve always been sensitive to the issue of mental health and how it can change people’s lives. Q: Why do people end up in your courtroom? A: It seems obvious to me, maybe because I see it all the time. But people who have mental-health issues and don’t get the treatment tend to seek other ways of addressing what is wrong with them. I don’t know that they all recognize that they have schizophrenia or they’re depressed. But they know that methamphetamine makes them feel better if they’re depressed. Or they know that alcohol makes them forget about things. So they have a tendency to self-medicate. And it is an almost universal truth that people in our population aren’t just mentally ill. They come to us with substance abuse issues. Q: Why haven’t their mental illnesses been treated before they get to you? A: Some of it is people don’t have the resources to access treatment. Some of it is a lack of awareness. They know something is wrong; they don’t know what it is. Their Uncle Bob had the same thing and nobody ever figured out what that was. Or they have been diagnosed. They have undergone some treatment in the past. It didn’t feel good to them, so they quit following the treatment. One of the advantages of having somebody in a supervisory environment — some place where conditions can be placed on how they interact and what they’re supposed to do and what medications they take — is that we can enforce the behavior that we want them to carry forward. The transformation that occurs in the course of the court’s four phases is: first they’re resistant, then they’re ambivalent, then they’re interested, and then they’re enthusiasts. One thing mental health courts do really well is get folks in a routine that makes them appreciate how much treatment can help support their success. Edited for clarity and length. 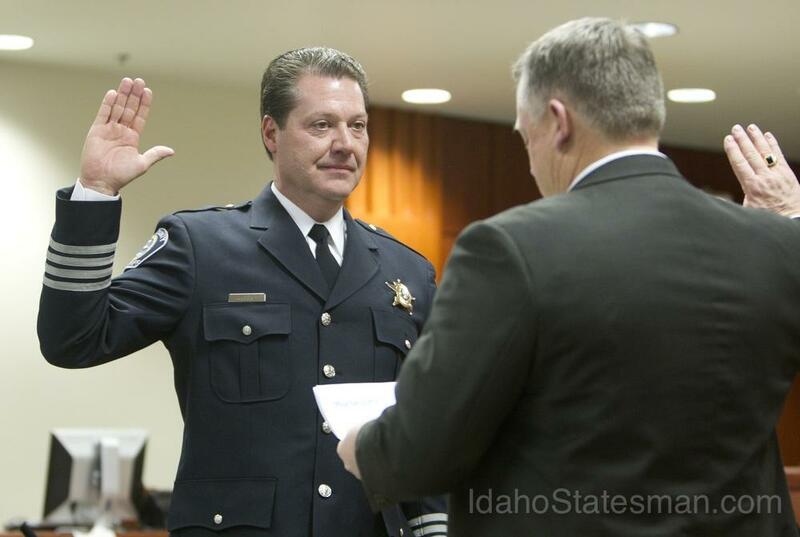 Ada County Sheriff Gary Raney being sworn in at a public reception Jan. 14, 2013. Many Idahoans held at the county jail have mental illnesses, Raney says. "We need to return Allumbaugh House to its original vision, or find another facility that helps the mentally ill before the crisis happens and someone becomes a victim," he says. Idaho prisons and jails aren’t just places for incarceration. They’re also mental-health providers. The Ada County Jail, where several people interviewed for this series have spent time, has a psychiatrist and psychiatric nurse practitioner on call 24/7. The jail also employs three full-time licensed clinical social workers. He said “the vast majority” of inmates who come into the jail with a mental illness are released with a treatment plan. But they have “little to no ongoing support” to help them continue their treatment, so they end up back in jail. On any given day, about 6 percent of the Ada County Jail population has a “mental health chronic-care alert,” meaning the inmate has a severe or persistent mental illness, is not adapting psychologically to the jail or has made a serious suicide attempt in the jail. The jail had 375 inmates with those issues in 2011, said sheriff’s spokesman Patrick Orr. Those inmates ended up having a much higher re-offense rate than average. About 75 percent were back in jail within two years — the highest recidivism rate of any group of offenders, Orr said. By comparison, the re-offense rate for Idaho’s prisons over a three-year period is about 35 percent, according to the Idaho Department of Correction. "In Crisis" is a collaboration between the Idaho Statesman and Boise State Public Radio. The voice started when Shawna Ervin was 16 years old, and it hounded her for two years. It told her to hurt herself. “It was relentless and wouldn’t stop laughing at me until I burned myself on my face,” she said. When she finally did burn her face, the laughter turned maniacal. Then it stopped. Ervin’s mental illness is not rare. She is one of thousands of Idahoans whose disorders can be severe enough to warrant hospitalization. Roy Vopal didn’t expect to live at a Boise Rescue Mission shelter in Downtown Boise this year. But the 60-year-old had a serious knee injury, then surgery, that he said left him unable to work for the first time in his life. Vopal says his service in the Marines during the Vietnam War left him with post-traumatic stress disorder. “There were times when I wanted my life to end,” Vopal said. He attempted suicide in his 30s and used drugs. Several people interviewed by the Idaho Statesman and Boise State Public Radio did not want to be named or quoted because of stigma surrounding mental illness. Shawna Ervin of Nampa believed the issue of mental illness in Idaho is important enough to share her story, despite concerns from a family member that doing so could hinder her job search. Shannon Guevara of Nampa did not seek treatment for decades for her bipolar disorder because of stigma around psychiatric disorders. Philip Mazeikas, now 26-years-old, started noticing signs of his mental illness when he was 18. "I started thinking there was a prophecy about me rising to power, or being famous," he says. "Things turned worse when I was 23, when I started hearing voices." By the time Mazeikas was 24, the Boise Police Department had been called to his home more than once. Mazeikas had become unpredictable and volatile. "He would sometimes say to us, 'Hey Dad I'm back, I've been gone a while'," Mike Mazeikas recalls. Two years ago, Philip Mazeikas answered the front door of his family home. The course of his life changed when he opened it. At 24-years-old, Mazeikas found himself in the middle of his first psychotic episode. He thought he'd been contacted by aliens who were using him in a scheme to control the world. He wasn't eating well. He was drinking his own urine.